Welcome back to our first of sixteen blog posts designed specifically for the upcoming Easter holiday. 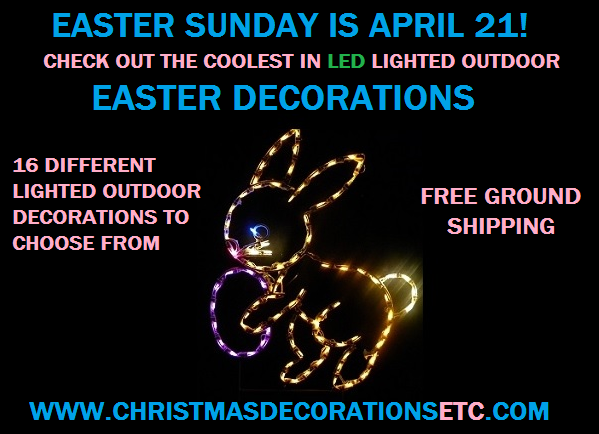 We have a wonderful new selection of high quality outdoor lighted Easter Decorations, that would make the Easter Bunny proud. Today we want to show you the delightful lighted Easter Bunny holding a lighted Easter egg. Because all the new designs are made with LED string lights, the colors on the decorations are absolutely awesome. LED string lights are able to more accurately display pastel colors in their true capacity. The end result is a much more vibrant product that way more colorful, bright and durable. Not too mention that this decoration because it is LED, uses only a small fraction of the energy normally required for traditional outdoor lighted decorations. The decoration is extremely energy efficient. The LED string lighting is pre-installed on the powder coated white steel frame. All the bulbs are intact and pointed the same way, so it looks really cool at night. If you need to replace a bulb, we include extra bulbs with the decoration so no need for concern. The lighted Easter Bunny stands more than 3 feet tall and is really impressive. The lighted Easter Bunny with Lighted Egg, can be used on your front lawn. You just stick the decoration in the dirt and you’re done. Some of you might want to hang it from a railing, window or staircase. In that case, the decoration only weighs approximately 5 lbs so don’t be concerned that it is too heavy. You can use cable ties or thin wire to connect the lighted decoration to wherever you want to use it. Right now after discount, this lighted bunny is only $117 and that INCLUDES FREE GROUND SHIPPING to anywhere in the continental USA. Your order will ship FEDEX 3 to 5 day service. So if you place your order today, you would have it, in approximately one weeks time. That’s providing the item is still in stock. Naturally, we don’t stock as much Easter as we do Christmas, so we can only make this offer to you while supplies last. Come on over to ChristmasDecorationsETC.com and see for yourself this whimsical selection of lighted outdoor Springtime decorations all MADE IN THE USA. Just wait until you see what we have to show you. We know you will be pleased. Until next time..